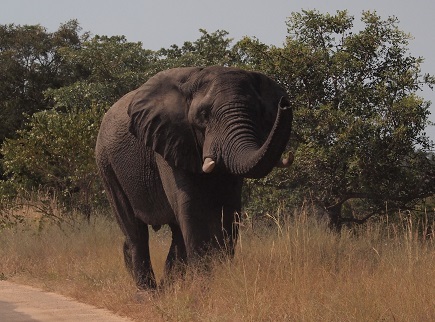 Kruger National Park is South Africa's greatest game reserve, and we had the good fortune to go there twice -- once from Graskop with a guide, and once from White River with Estelle and Errol Spencer, who were at least as knowledgeable as any professional. 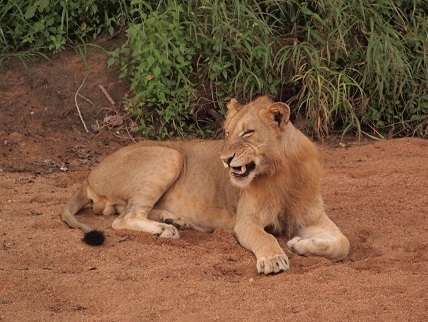 On this page we'll show photos of Kruger and the animals we saw, and also mention other things we saw or did in the days when we were in the area. 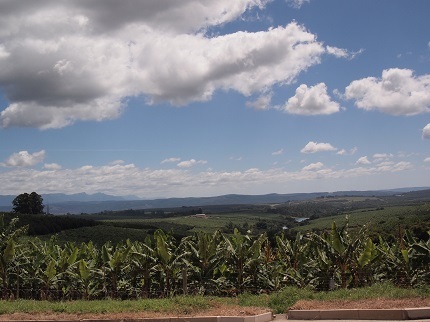 We rode back to Graskop on Saturday, March 9. The little town had become our base, both for our earlier ride around the Panorama Route, and also for our first visit to Kruger. 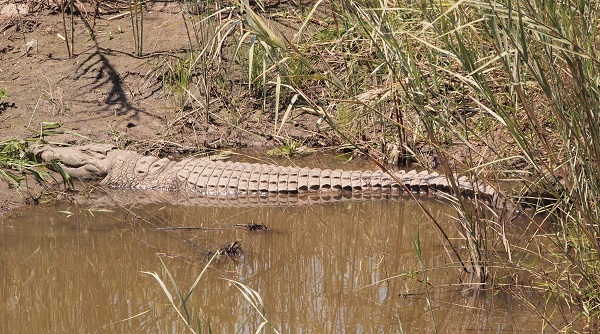 We arranged to visit Kruger on the 11th and 12th, which gave us March 10 as a layover day in Graskop. Unfortunately, Sunday the 10th was cloudy and intermittently rainy. We paid a visit to Ismail Sarang (right) at his shop and, later, at his home near the backpackers. 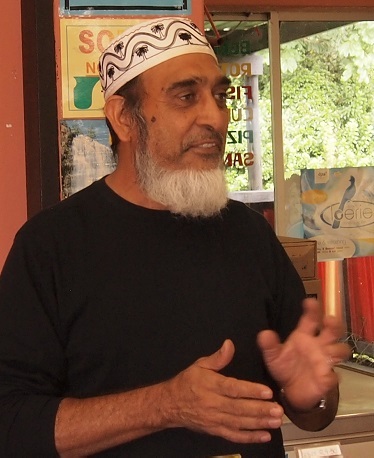 Ismail was wonderfully friendly and informative, and his wife made the most amazing samoosas! Twice we ordered dinners and at the end of the day Ismail brought them to his home, which was just around the corner from Valley View Backpackers. We wish that we'd had more time to spend with him and his family. 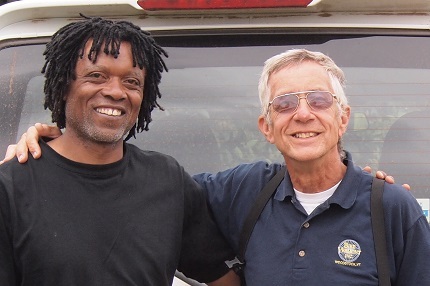 Joseph (right, with Wally) is one of the owners of Valley View Backpackers, and he is also a licensed Kruger guide. 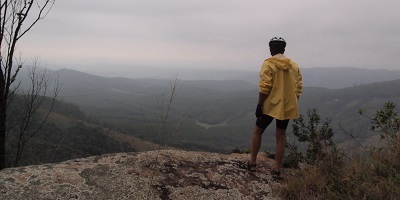 Our plan was to ride to Kruger with Joseph early in the morning of March 11. 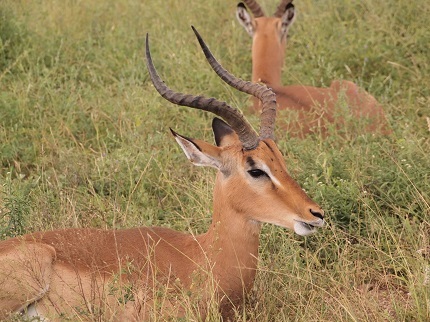 It would take about an hour, and we wanted to arrive when the gates opened at 6 a.m. We would spend the day looking for game, camping in the park for the night, and then drive around some more on the 12th, returning to Graskop late that afternoon. For the most part, things went even better than we had hoped. On the 11th, we were up soon after 4 a.m. and on our way to Kruger at 5. Everyone who visits Kruger, or any other African game park, hopes to see the "Big Five," elephant, rhino, Cape buffalo, lion, and leopard. By a combination of good luck and Joseph's skill at spotting game, we saw them all on that first day, and more! 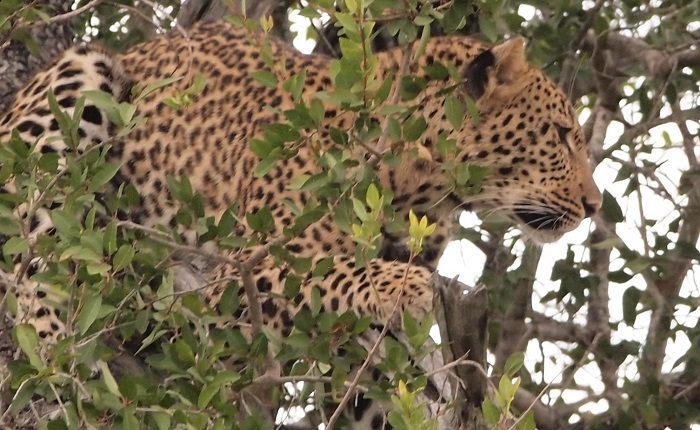 We were lucky to see a leopard soon after we arrived; they are the most elusive of the Big Five. 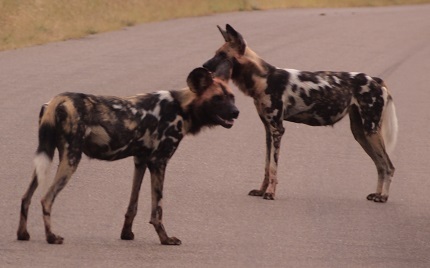 Wild dogs are rare, so we were lucky to see them also. Well, maybe. 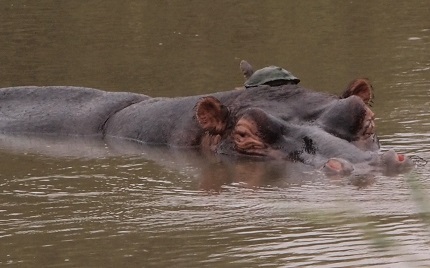 The hippo is homely even wearing a fashionable hat. 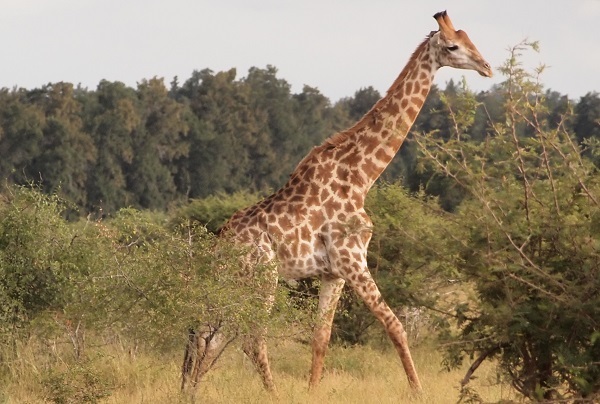 On the first day we saw many giraffe, possibly our favorite of all the animals.. 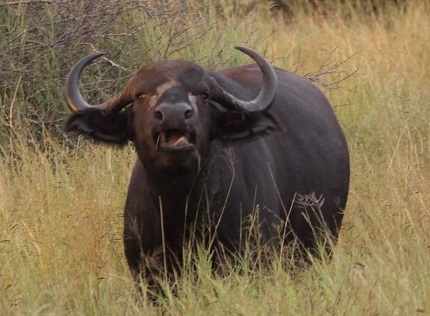 The Cape Buffalo is no beauty, but it is formidable. 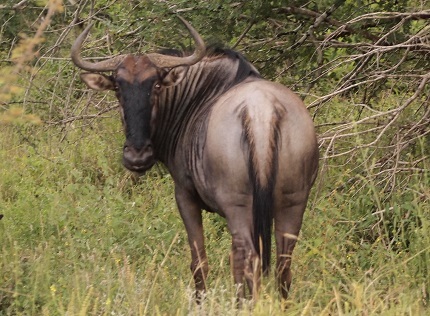 This wildebeest is rather good-looking for a wildebeest. 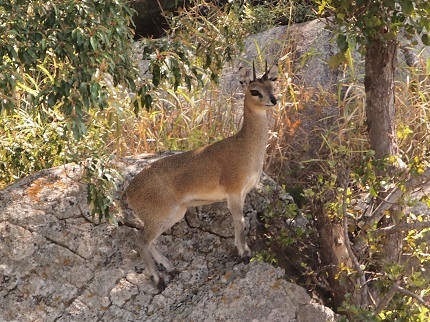 ... and the tiny klipspringer, "rock hopper" in Afrikaans, was cutest. There was one disaster on the first trip to Kruger. In the evening, the braii (barbecue) was knocked over, spilling boerewors, chicken, other food, and hot coals into the sand. We washed things off, scooped up the coals, and tried to salvage the meal. There was still a little sand on the boerewors; we noticed that Joseph never finished his chicken. In Hazyview We spent two nights in an utterly beautiful B & B -- by mistake! We had read a rave review of Idle and Wild in a guidebook, and Wally telephoned to ask the rate. It was a little higher than we were accustomed to paying, but we believed it would be worth it. Indeed it was. Then, after the second night, we were horrified to learn that the rate Wally remembered was per person, not for the room, so our bill was double what we had expected. It was still worth it. 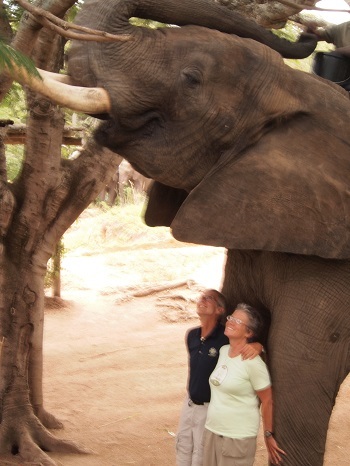 The highlight of our layover day in Hazyview was a visit to "The Elephant Whisperer." This is undeniably a tourist attraction, but a worthwhile one, we felt. 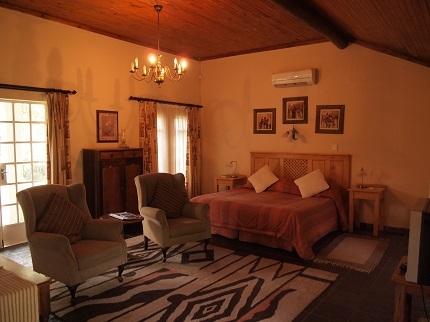 A Zimbabwean couple named Renfield founded the operation years ago when they lost their game ranch near Chinoyi. They had been adopting and training rescue elephants, using positive reinforcement and demonstrating the elephants' amazing abilities. 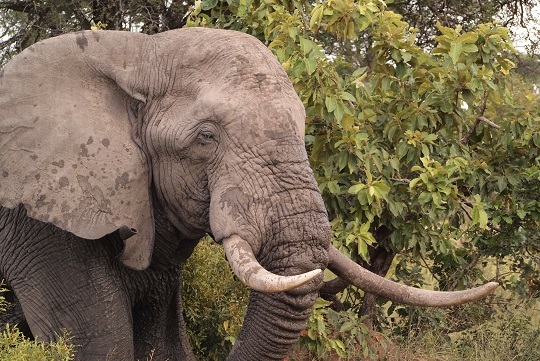 It turns out to be a complete myth that African elephants cannot be trained. They established a non-profit called "EFAF," Elephants for Africa Forever. 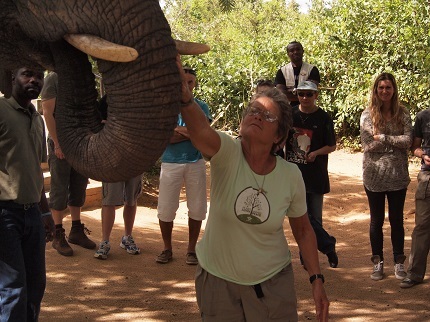 The rescue and sometimes training of elephants is funded by fees from their tourist ventures like this one. 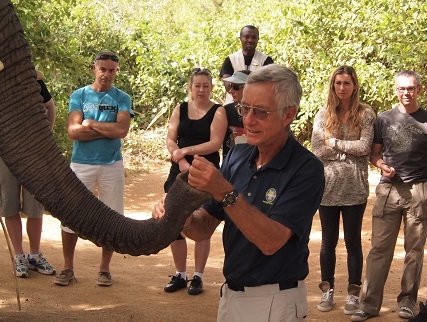 Among other things, a visit to the Elephant Whisperer involves a fascinating talk about elephants and an opportunity to feed them and to touch and feel their trunk, ears, flanks, feet, even their eyelashes. If you pay extra, you also get to ride on an elephant. We couldn't resist. In sum, it was interesting and fun, and our granddaughter Nicole should have been there! Elephants, by the way, are BIG! How did they say to feed hinm? On our way back to Idle and Wild, we stopped at Summerfield, a farm/resort/bakery/restaurant. We wanted to buy some of their bread and organic vegetables. While we were there, a hostess asked if we'd like a tour. Barbara said "yes" immediately, thinking it would be a look at the gardens. 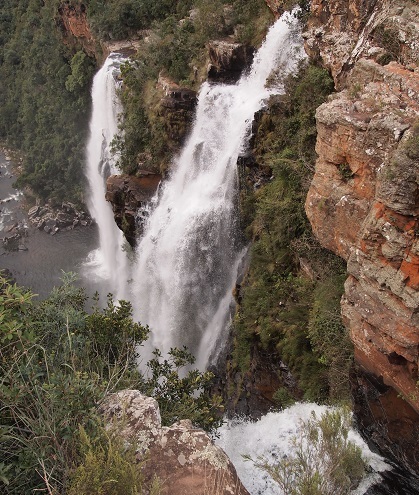 In fact, we were loaded into a leather-lined, million-dollar Land Rover and driven down to the Sabie River. There, we saw the accommodations and restaurant. Luxury tents on platforms with verandas were open to the rushing river, with king beds and every imaginable comfort -- quite unlike any other tents we've ever seen! 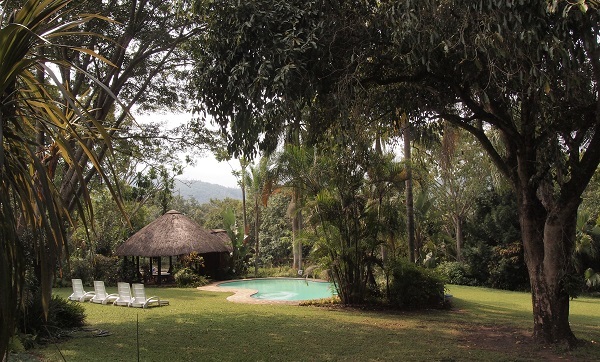 The restaurant, also outdoors over the river, was a gourmet affair, and there were spa facilities offering massages and many other treatments, all in either tents or rustic buildings scattered through the tropical forest. How I wish I'd taken some photos! Apparently the place is well known and ridiculously expensive, certainly far out of our league. 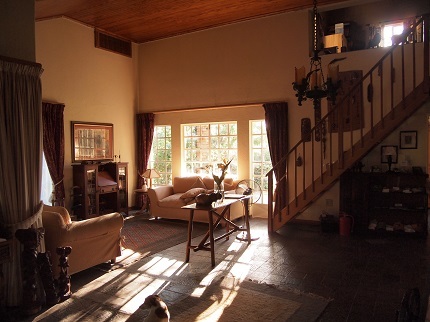 On the 15th, we left Hazyview and cycled back to Errol and Estelle's home in White River. On the way, we were flagged down at a fruit wholesaler. It seems we had met and spoken briefly with the owner. Without telling us, he phoned ahead and asked his staff to stop us and give us cold drinks and fresh fruit to take on our way. How nice! When we arrived in the town of White River, another memorable incident occurred. We stopped at a sidewalk restaurant in a shopping center for lunch. When we rode away, we left a pannier under the table, the pannier containing a computer and a Kindle, among other things. Neither of us realized it was gone. A few minutes later, Wally decided to return to the shopping center to buy some vanilla ice cream, Errol's favorite. As he entered the supermarket, a young African man came running to return the forgotten pannier. It's hard to explain how starkly this honesty contrasts with the things that so many South African whites say about their African countrymen. It was good to see Estelle and Errol again, and they served us a delicious dinner. 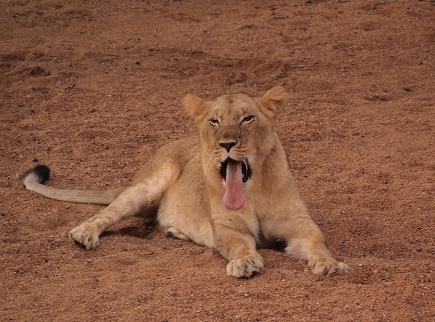 We got to bed early because we would be leaving for Kruger around 6:00 a.m. the next morning. Estelle was amazingly organized, with a picnic breakfast and lunch all set to go. 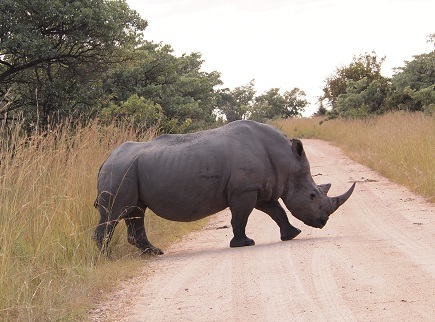 This big boy came into the road and forced us to back up a long way. 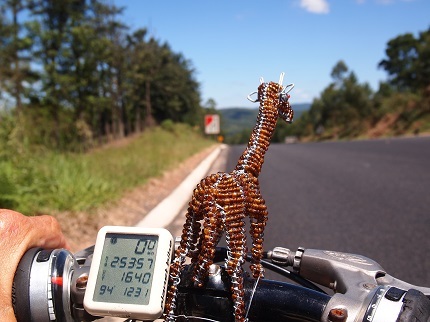 On the morning of the 17th, we said goodbye to Errol and Estelle for the second and final time and cycled down (literally) to Nelspruit. It would be the last cycling of our tour. On a quiet suburban street, on the steepest hill we encountered in 1,200 miles, Wally toppled over and scraped his elbow. No harm done, but it was an ironic finale to our great cycling tour. We returned again to Old Vic Travelers Lodge well before our room was ready, forcing Wally to recuperate for a couple of hours in the shade by the pool. Wally spent nearly all of the 18th on the internet and telephone, trying to arrange transportation to Johannesburg for us and our bikes, and also trying to book a car for our trip to Zimbabwe. It was a hugely frustrating way to spend a fine, sunny day, but before supper time, we were all set to leave for Johannesburg and then on to Zimbabwe.